It’s a thoughtfully chosen and satisfying dinner as served at the Vanderbilt Hotel in New York City. Monsieur Edmond Bourquin, chef at that noted hostelry, here tells you how to prepare it. And he will send you his personal recipes for ten other unusually delicious Vanderbilt specialties—for only the asking. 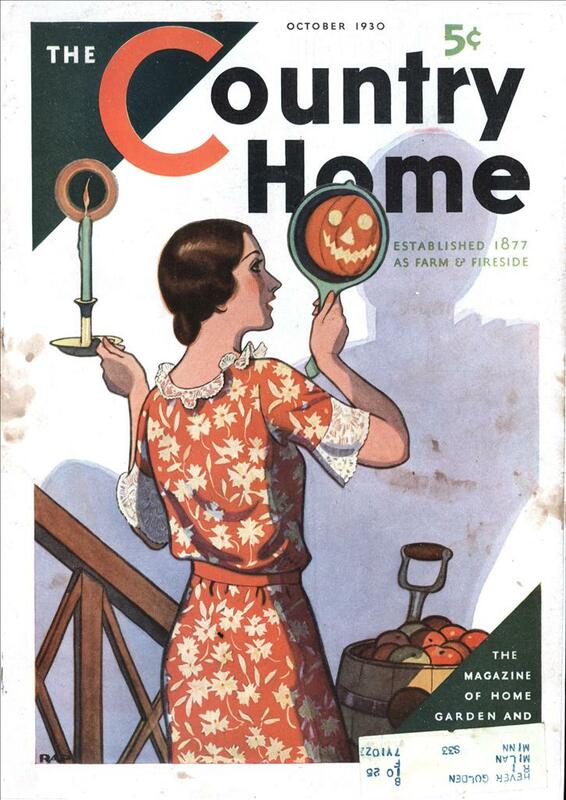 Just send a stamped self-addressed envelope to the Cooking Editor, The Country Home, 250 Park Avenue, New York City. Clam-Juice Cocktail: Make a cocktail sauce of several tablespoons of tomato catchup flavored with horseradish to taste. To one part of this sauce add five parts of strong clam broth. Chill thoroughly, and before serving add two drops of tabasco sauce and a dash of lemon juice to each portion. Serve very cold. English Lamb Chops Vanderbilt: Broil loin lamb chops with kidney. When almost done put a half tomato and a slice of bacon on each chop and finish broiling. Serve with French fried or allumette (match-stick) potatoes. Garnish with watercress and put a tablespoon of Maitre d’ Hotel butter on each chop (cold fresh butter kneaded with chopped parsley, pepper, salt and a little lemon juice). Floating Heart Montmorency: Boil together for a half minute one pint of cream, four egg yolks, and a quarter pound of powdered sugar. Allow to cool. Stir, flavor with vanilla to taste, add three quarters of a quart of cream and whisk all together in a bowl set in cracked ice, till it becomes frothy and cold. Then it is ready to be frozen. Spaghetti Caruso: Cook spaghetti till tender. Stew a liberal quantity of tomato paste with parsley, carrots, a little ham and onion to taste; strain this mixture and use as a sauce on the spaghetti. Fry chicken livers in butter; chop them fine and place in center of spaghetti. Sprinkle with grated cheese. 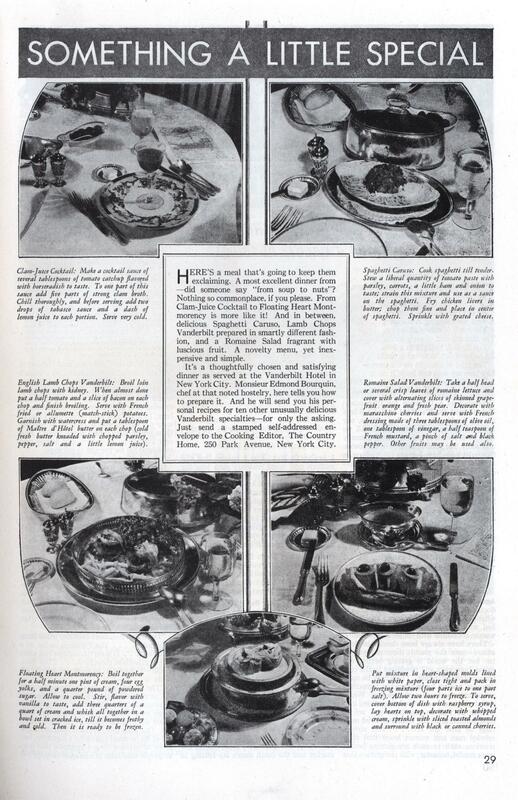 Romaine Salad Vanderbilt: Take a half head or several crisp leaves of romaine lettuce and cover with alternating slices of skinned grapefruit orange and fresh pear. Decorate with maraschino cherries and serve with French dressing made of three tablespoons of olive oil, one tablespoon of vinegar, a half teaspoon of French mustard, a pinch of salt and black pepper. Other fruits may be used also. Put mixture in heart-shaped molds lined with white paper, close tight and pack in freezing mixture (four parts ice to one part salt). Allow two hours to freeze. To serve, cover bottom of dish with raspberry syrup, lay hearts on top, decorate with whipped cream, sprinkle with sliced toasted almonds and surround with black or canned cherries.